Superdry women’s Performance lightweight jacket. Take your training routine to the next level with this high quality Superdry Sport jacket. This jacket has been designed with a shower resistant shell which is weather tolerant, high visibility detailing and Superquick dry fabric. This jacket features a single zip fastening, a single zip with reflective trim on the arm and two external zips on the front. 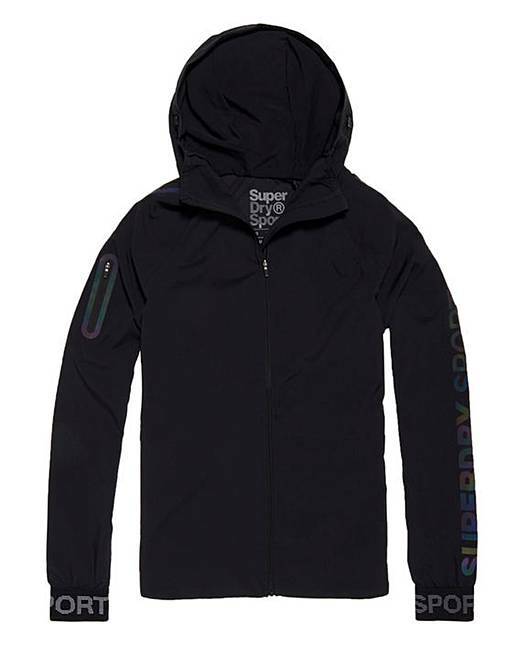 This jacket also features reflective detailing on the shoulders, a reflective Superdry Sport logo down one arm to be seen in low visibility and an elasticated hood. For the finishing touches, the performance lightweight jacket has reflective elasticated cuffs and hem.